General swimming pool contractor. Specializing in modern easy to use and self cleaning swimming pools and spas. 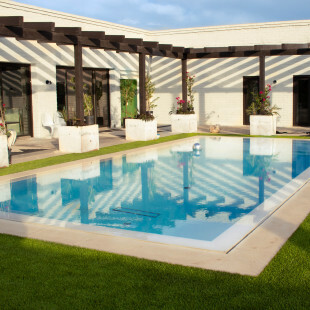 Renovation of existing pools and spas. We are honest and treat our customers with respect. We do not disrespect other Pool Builders. We strive to explain pool equipment and other choices during the design and sales process. Preferring to offer choices with our guideance based on over 20 years of experience. There is no best choice, only a best choice for each individual customer based on their expectations and budget. Our equipment suppliers are not based on cost, rather on quality, ease of maintenance, and longevity. Our subcontractors are not chosen based on price, rather on quality of work. We do not pressure our subcontractors to lower their prices to get the job. Quality is more important than cost. We think in 10 year units, not on the 2 year warranty requirement of State Law. This means if we see excessive failures in a 10 year span, we reevaluate the part to see if a better part is availible, or discontinue that part. Pools should be low maintenance, and stay attractive for an extended period of time. The choices to match aesthetics with durability are part of our presentation process. Anyone can show you a pretty pool only a few years old, we strive to build pools which will look good after 20 years or more.